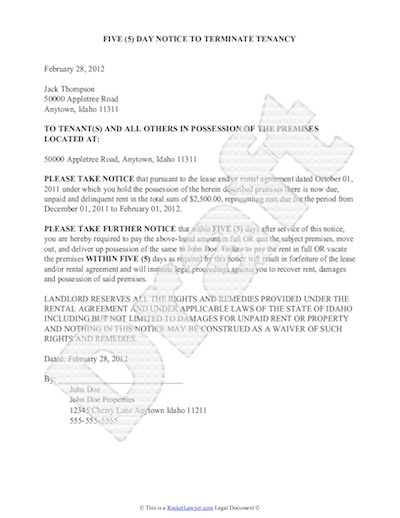 Like all eviction notices, this sample eviction notice contains the information you’ll need when evicting a tenant. The offense (such as breaking the terms of the lease) and a time period to remedy the offense (such as ten days from the service of the notice) should be included, as well as the name of the tenant and, of course, the landlord. The sample eviction notice below cites non-payment of rent as the reason for eviction and gives the tenant five days to pay before the landlord moves the process forward. This document template is similar to most eviction notices. Sample Eviction Notice. To get your own personlized Eviction Notice, click the image above. Depending on your state and locality, eviction can be a difficult process. If you’re considering starting that process, make sure you know the reasons to evict a tenant and think about contacting a real estate lawyer in your area. Laws vary between—and sometimes within—states, so it’s important to be informed.